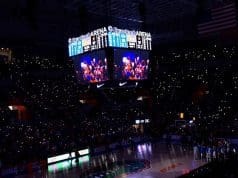 Florida Gators senior point guard Chris Chiozza said he won’t shed a tear on Saturday, but his may very well be the only dry eyes in the building as he takes the court for the final time in the O’Connell Center. He will be honored alongside fellow seniors John Egbunu and Egor Koulechov. With more than a dozen of Chiozza’s family members making the trip from Memphis, Tennessee, it is sure to be an emotional day, but at the end of it, there’s still a game to be played against Kentucky. No matter what happens on Senior Day, one thing is for sure, Chiozza’s story will go down as one of the greatest in Florida history. 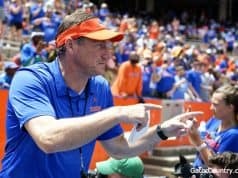 His career could’ve gone a million different ways after his freshman year when Billy Donovan’s departure to the NBA capped off Florida’s worst season in nearly two decades. That left Chiozza with a new coach he had never even heard of at a school 700 miles from home and no idea what the future of the program would be. He could’ve easily threw in the towel and filled out his transfer papers, but he instead made the decision, along with his former teammates, to stick it out. Now, he can’t imagine where he would be if he had chosen to leave, and neither can the coach he had never heard of. When White first took over, Chiozza was nowhere near the player he is today. He had the quickness and vision and all the other attributes that make him so dangerous, but he still had a lot of growing up to do. It wasn’t until about midway through his junior season that he decided to throw away the all-about-me attitude that a lot of young guys come in with. Once that was gone, his progression on the court followed. It was evident in a triple-double against Missouri and his famous game-winning buzzer beater to defeat Wisconsin in the Sweet 16. 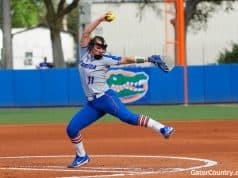 Now, he leads the Gators by example every single day and has arguably become the most valuable player in the country in terms of what he means to his team. It’s astounding to see just how big of a difference there is when Chiozza is not on the floor or even when he just isn’t playing at his best. It’s like Florida loses its confidence and isn’t quite sure what to do until he is back to lead the way. That isn’t necessarily a good thing, but it proves just how much his presence changes the course of the game. That is best proven in his ability to create shots for his teammates. 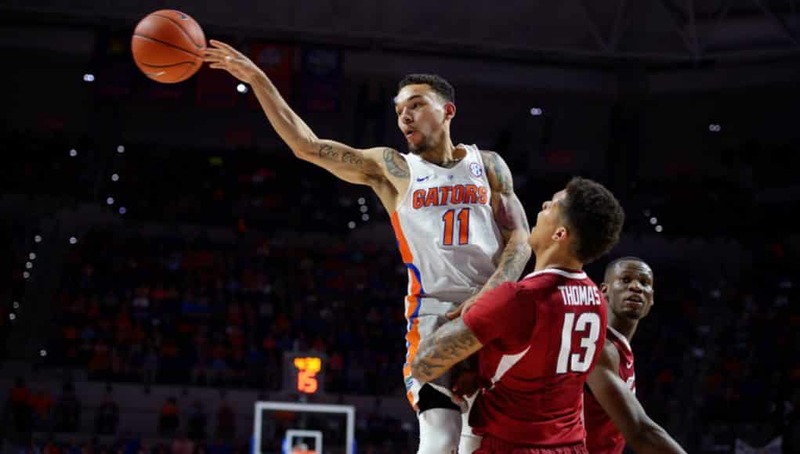 Whether it’s a no-look, behind the back or between the legs, Chiozza makes every pass look so effortless. Despite only getting limited starts in his first three seasons and having to take a backseat at the point guard position until this year, he has found a way to put his name in the record books. Barring something crazy, he will become Florida’s sole record holder in career assists on Saturday. He tied Erving Walker’s mark at 547 at Alabama on Tuesday. He didn’t even know he had tied it during the game, and he nearly broke it after setting up a couple of open looks for guys in the last few minutes, but they all missed their shots. Once he found out, he was thankful for those misses so that he could have the opportunity to share it with the fans at home. The O’Dome might just break the decibel meter when that moment does come. Chiozza said the last four years have come and gone so fast that it’s like he just woke up and Senior Day was here, and the rest of it was a blur. While his career is quickly coming to an end, his legacy at Florida is just beginning. He could have easily thrown in the towel, as I know you meant to say. We have had great moments in Gator basketball history, Chris’ career has been a great moment. Thank you Chris Chiozza !